Tom and I are training for the A1A (Fort Lauderdale) Half Marathon next month and we’re getting to that point in our training where I get really, drugs really hungry in the afternoon. I’m not talking about your typical afternoon snack craving. I’m talking full-on hunger pangs with embarrassing stomach grumbling. The kind that always happens during a quiet lull in your meeting and makes your co-workers giggle. Like I said – embarrassing. I needed to take action. I needed a snack. Something that was filling and nutritional, order but also tasty. These Nutty Power bars are it. 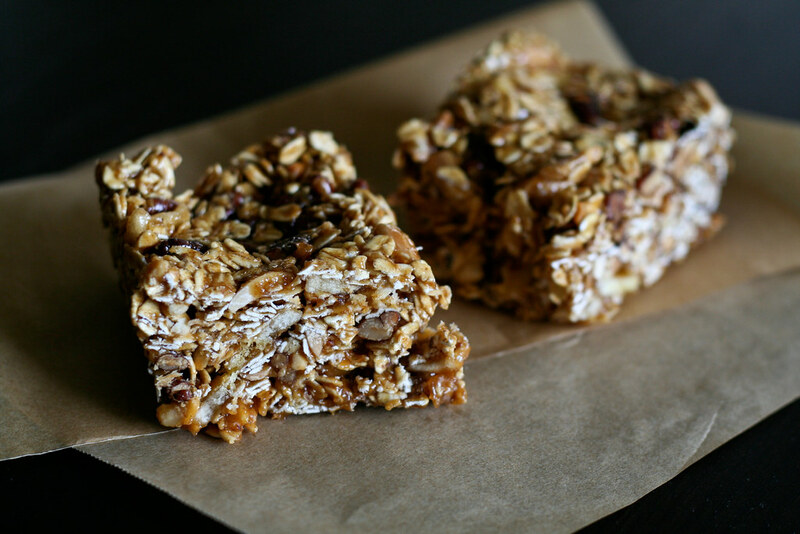 They’re really similar to my homemade granola bars, but I added more nuts and peanut butter and omitted the brown rice cereal to keep them dense and nutritionally packed. I love how sticky salty and chewy these are. Just perfect for marathon training, regular snacking and keeping my tummy quiet during meetings. Preheat the oven to 325Â°. Spread the almonds and pecans on a cookie sheet and toast them in the oven for 6 â€“ 8 minutes, or until they start to brown a bit. Remove from oven and let cool. In the meantime, line an 8 x 8 dish with parchment paper or foil and set aside. Now, mix the oats, banana chips, cinnamon, cardamom and salt in a big bowl. Add the nuts once theyâ€™ve cooled. In a small saucepan, heat the agave nectar, brown rice syrup, peanut butter and vanilla extract over medium heat, stirring to avoid burning. Once the syrups come to a light boil, continue to cook for an additional 3 â€“ 5 minutes until the syrup begins to thicken, then pour it over the oats and nuts. Mix everything together so that the syrup evenly coats everything in the bowl. While itâ€™s still warm, pour the contents of the bowl into your prepared dish. Using a rubber spatula, pat everything down so itâ€™s nice and compacted. Cover with more parchment paper and press down again. Let cool to room temperature. You can also put them in the fridge for a bit since thisâ€™ll make cutting easier. Cut them into 2-inch square. What is your training schedule? I’ve always wanted to do one but haven’t found the time to properly train. Hi Amanda – I’m following this training plan. Yoga on Monday, run on Tuesday, weights & core training on Wednesday, run on Thursday, rest Friday, cross-training Saturday, long run on Sunday. Omg, I totally agree. I find that towards the end of the week, when I play tennis more I am full on hungry nearly every two hours. These look like the perfect snack to tide me over. Thanks! these looks wonderful and easy! loved your description of who you are which included a grocery store junkie. i didn’t realize that i was very much that way too as I love going to ethnic stores on Saturday morning and spending hours checking out ingredients and trying new dishes with those ingredients. Living in the Toronto GTA provides a an immensely rich opprotunityt for that ( Chinese, Spanish, Italian, Ethopian, Japanese, Eastren Europen, Jewish,Korean, Greek, West-Indian..the list is expansive.) I am an ethnic store junkie. I’ve recently started to make “energy” bars in an effort to avoid noshing and eat healthier. This is the recipe I’ve made a few times: http://havecakewilltravel.com/2008/09/09/a-pumpkin-walks-into-a-molasses-bar/ . I sub honey for the molasses and add in 1/3 cup of pepitas and 1 heaping TB of flax meal. I’m looking forward to trying this recipe with a few modifications; I’m allergic to almonds. I volunteered at one of the water stations for the A1A marathon a few years back. It’s an awesome run by the water. Good luck! Oh, I should add that you might want to consider adding in the vanilla extract after you heat it so that it doesn’t evaporate out. THese look great– perfect quick in between meal/workout snack. I love that they are easy to prepare too. I’m going to give these a try! Thx! Wow – this is my third comment in a matter of minutes. Um…a little embarassed here. DORK ALERT!Meh – whatever. I teach group exercise classes and have a special class coming up. Wanted to make some kind of healthy treat to give the peeps who come to my class and I think I just found it. These would be perfect. Answer: This is a bug with Apple’s version of Java. There is a workaround, however. The workaround can be found by clicking here.